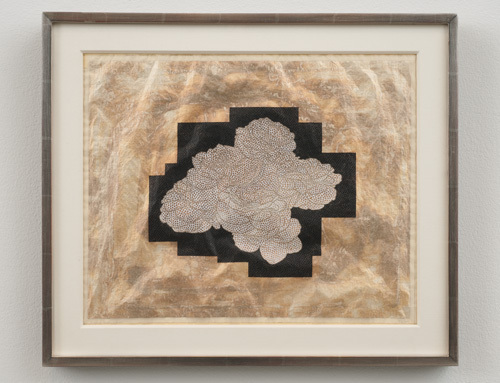 Tom Wudl, Cloud Blossom, 2011, pencil, oil paint, silver leaf on vellum, 13 1/4 x 16 1/2". The delicate intricacy and irrepressible zeal of Tom Wudl’s art are on full display in this exhibition of ten small works on paper. Some are no bigger than four by four inches, and the largest is just over a foot wide, but size is no measure of impact here; the ethereal works command a kind of meditative attention—intensity of focus combined with blissful absorption—similar to the immersive concentration necessary to produce this degree of detail at such a small scale. Each work depicts a flower—many are studies for the largest work, Cloud Blossom, 2011—composed of microscopic pips (more well known as the clubs from the suit of playing cards) laced within the miniature confines of a finely wrought grid; frail geometry subtly balances and supports organic forms. The application of pencil, oil paint, and gold and silver leaf to vellum lends each surface an undulating tactility, as if template and flower were floating on a tranquil pond or suspended in a hazy sky. Though Wudl typically layers tiny pips into elaborate representations, the contemplative sensibility of this exhibition seems to be derived from its impetus, a thousand-year-old Mahayana Buddhist text titled the Avatamsaka Sutra, translated into English in 1993 by Thomas Cleary. But Wudl’s interest in distillation is not limited to esoteric texts; the flowers also invoke works by Agnes Martin and Sol LeWitt, in which grids similarly corral complexities into multiplying layers of ordered calm.